By far, the most common reason to take modafinil off-label is for cognitive enhancement. But, it has other uses too. Some of those uses even border on the bizarre. And while taking modafinil for weight loss maybe doesn’t entirely fall into that category, it’s certainly far from being a mainstream application of it. That said, just because weight loss is generally seen as a modafinil side effect, doesn’t mean the drug isn’t effective at making it happen. So, with that in mind, let’s take a closer look at modafinil, how taking it can lead to you losing weight, and if it’s really the type of weight loss aid you want or should use. Modafinil is a eugeroic (a wakefulness-enhancing agent) initially intended to treat various sleep conditions. Those conditions include obstructive sleep apnea , narcolepsy , and shift work sleep disorder . 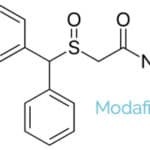 The off-label use of modafinil has been on a steady rise in recent years, in large part thanks to its impressive cognitive enhancement properties . It’s used by high tech professionals, entrepreneurs, students, gamers, and even sports enthusiasts to boost both mental and physical performance. While it’s been compared to Adderall in its effects and is often used as an alternative to it, modafinil has a much less intrusive effect on your brain’s neurotransmitters than the typical stimulant . Its side effects are also a lot more gentle (if there at all), and the typical post-stimulant crash is almost non-existent. In short, yes, modafinil can help you lose weight. In fact, it can be quite effective at it. There are several reasons for this. First, and most important for weight loss, modafinil acts as an appetite suppressant . After taking it, you can typically go for many hours without feeling the least bit hungry. That effect is further enhanced by one of modafinil’s best off-label benefits which is its ability to improve concentration . It’s so good at it that you often find yourself much too focused on your task to remember to eat. As an aside, you’ll also often forget to drink. That, however, is something you should try to prevent. It’s an easy way to dehydrate yourself which can then lead to the famed modafinil headaches. A moderate dose of modafinil will put you in the right mindset to act on just about anything. You won’t be held back by tiredness, lack of will, or lack of motivation. It can help you both stick to your diet, and your exercise routine. The third way in which modafinil may help with weight loss is a bit more indirect. 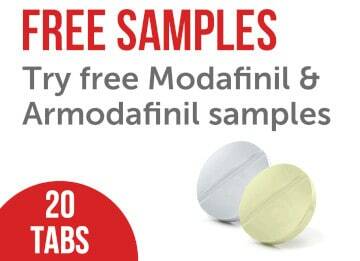 Modafinil was designed to and does keep you awake for extended periods of time . And no matter what you do, when you’re up, your body uses a lot more energy than it does when you sleep. So, by keeping you on your feet, modafinil will make you burn more calories each and every day you take it. Behind the scenes, modafinil works by boosting several of your brain’s neurotransmitters . The list includes histamine, dopamine, and norepinephrine. All three of these compounds are believed to play a part in modafinil’s ability to help with weight loss. Histamine has many purposes, and one of them is the regulation of your appetite . Specifically, the reduction of it. By increasing the production of histamine, modafinil directly causes you to feel less hungry. Dopamine and norepinephrine both promote wakefulness . As already mentioned, when you’re up, you burn more calories than while sleeping. By keeping you awake for longer, these two neurotransmitters should cause your body to burn more energy. Dopamine is also the feel-good neurotransmitter . It’s released when we eat junk food, giving us pleasure and leaving us wanting more. With already a good amount of dopamine in the system thanks to modafinil, eating something not so healthy won’t cause nearly the same level of want for more. It will prevent us from indulging. When you consider the science behind how modafinil works combined with the many modafinil and weight loss success stories you can find in across the internet, it’s not a far stretch to conclude that it can indeed help you lose weight. Because it’s so similar to modafinil, many people wonder if taking adrafinil can have the same positive effect on their weight. The most significant difference between the two drugs is that adrafinil is a prodrug to modafinil. Your body needs to metabolize it and convert it for it to become the latter . This process takes about an hour. After it completes, the effects you experience should be identical to those given by modafinil. In other words, everything that modafinil does to help you lose weight, adrafinil should do as well. Other than that hour or so delay before it becomes active, there are a couple more things to be aware of if you intend on using adrafinil for weight loss. 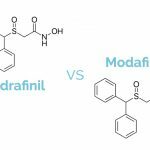 Adrafinil has a significantly shorter half-life than modafinil . To get the same cumulative effect, you’ll have to take it at least a couple of times a day. Also, because of the conversion process, using adrafinil puts a bit of extra strain on your liver . Unless you’re going to follow a high-dosage, long-term regimen, you likely won’t have to worry about it. But, it is a potential side effect to keep in mind. Given a choice between taking adrafinil or modafinil to lose weight, I would opt for the latter. I prefer going straight to the source. And, even though you can get adrafinil from places like Absorb Health for as little as $1 per pill, because of its short half-life, you will have to take it a few times each day to get the same effect modafinil gives you. 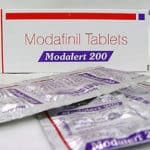 Considering you can get modafinil for even cheaper than adrafinil, it is the more economical choice. Modafinil is one of the best smart drugs you can get, and its effects can positively contribute to weight loss. It will help you get into the right mindset, reduce your appetite, and have you burn a few more calories by keeping you active longer. I wouldn’t rely on it alone to lose weight as nothing beats proper nutrition and exercise for that purpose. But, using modafinil can certainly help. If you do end up taking modafinil while trying to lose weight, there are a few guidelines which are good to follow. Remember to drink copious amounts of water. Modafinil alone will make you thirsty, but if you’re also exercising, dehydration can sneak up on you that much quicker. Water is always good. When you get home in the afternoon, remember to eat something, even if it’s small. An empty stomach can get uncomfortable when taking modafinil. Having some food will also help you fall asleep easier come night time. Avoid mixing modafinil with caffeine or other stimulants. It will likely send your anxiety levels through the roof. Avoid insomnia by not taking modafinil too late in the day. Sleep is an essential part of healthy weight loss. Be aware that eating heavy foods will slow you down, both mentally and physically, even if you’ve taken modafinil. Modafinil is a smart drug with a long list of potential uses, including helping you to lose weight. And while it can be surprisingly efficient at it, it should definitely not be your primary tool. Overall lifestyle changes will be much more effective. That said if you do decide to get modafinil (here are a few good places where you can get it cheap) and take it every now and then to help in your weight loss efforts, remember to start off slow. The worse thing you can do is get too excited and overdo it. Whether you’re using modafinil to lose weight or increase your productivity, the key to success is always to go with the lowest dose that gives you results and to use it only as needed. Chapman JL, et al. Modafinil/armodafinil in obstructive sleep apnoea: a systematic review and meta-analysis. Eur Respir J. 2016 May; 47(5): 1420-8. Vivien C Abad, Christian Guilleminault. New developments in the management of narcolepsy. Nat Sci Sleep. 2017; 9: 39–57. Milton K. Erman, et al. Modafinil for Excessive Sleepiness Associated With Chronic Shift Work Sleep Disorder: Effects on Patient Functioning and Health-Related Quality of Life. Prim Care Companion J Clin Psychiatry. 2007; 9(3): 188–194. Battleday RM, Brem AK. Modafinil for cognitive neuroenhancement in healthy non-sleep-deprived subjects: A systematic review. Eur Neuropsychopharmacol. 2015 Nov; 25(11): 1865-81. Turner DC, et al. Cognitive enhancing effects of modafinil in healthy volunteers. Psychopharmacology (Berl). 2003 Jan; 165(3): 260-9. Maddalena Mereu, et al. The neurobiology of modafinil as an enhancer of cognitive performance and a potential treatment for substance use disorders. Psychopharmacology (Berl). 2013 Oct; 229(3): 415–434. 2014 Oct 1. Paul Gerrard, Robert Malcolm. 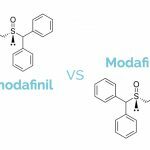 Mechanisms of modafinil: A review of current research. Neuropsychiatr Dis Treat. 2007 Jun; 3(3): 349–364. Perez GA, et al. Modafinil decreases food intake in humans subjected to simulated shift work. Pharmacol Biochem Behav. 2008 Oct; 90(4): 717-22. Dongsoo Kim. Practical Use and Risk of Modafinil, a Novel Waking Drug. Environ Health Toxicol. 2012; 27: e2012007. Jared W Young, Mark A Geyer. Action of modafinil – increased motivation via the dopamine transporter inhibition and D1 receptors? Biol Psychiatry. 2010 Apr 15; 67(8): 784–787. Jørgensen EA, et al. Histamine and the regulation of body weight. Neuroendocrinology. 2007; 86(3): 210-4. Oishi Y, Lazarus M. The control of sleep and wakefulness by mesolimbic dopamine systems. Neurosci Res. 2017 May; 118: 66-73. Oscar Arias-Carrión, et al. Dopaminergic reward system: a short integrative review. Int Arch Med. 2010; 3: 24. Norton W Milgram, et al. Adrafinil: A Novel Vigilance Promoting Agent. CNS Drug Reviews. Vol. 5, No. 3, pp. 193-212. Simon Manning is the creator and editor of Best Nootropics Now. A programmer in a former life, he has been researching and experimenting with brain enhancing supplements for close to a decade. If anyone knows a thing or two about nootropics, you can bet it's Simon.